Reflections on 2008, fireworks to welcome in 2009 and looking ahead to the year that will be. Early in the year of 2001, I decided to move away from Toronto to Denver, Colorado. It was to be an internal company transfer, and everything was in place for the move. I had permission from my existing boss, permission from my new boss and the HR department were all on board. I was already looking at places I might want to live in Denver. "2001 is going to be very different than 2000," I thought to myself. It wasn't. 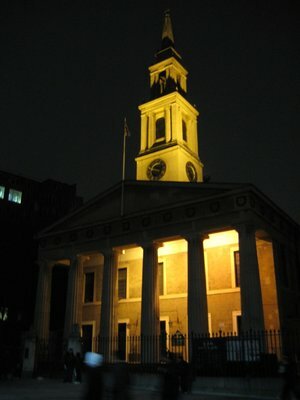 If you read this blog, you know that I never did move to Denver, but continued to live in Toronto. Denver, at the time (perhaps even still today, I don't know) was very tech heavy, and a lot of the work that my company did was for technology and telecommunications companies. With the burst of the tech bubble and full scale slide of tech stocks, many of these companies decided to stop hiring consultants. The Denver office of my company decided to start laying people off, and with that I was not going to get my transfer. I never really lost that dream, though, to live somewhere else. Over the years, though, it shifted from moving to the USA to moving somewhere farther afield. So every year, as midnight struck on New Years Eve and the new year was ushered in, I told myself, "This year is going to be different than last year." Over the years since 2001, lots of things changed for me, but never that really big step of moving aboard. Until last year. As I stood in the freezing cold of Quebec City last year ringing in 2008, I couldn't have predicted the course that my life was to take in 2008. By April I was unemployed (by choice) and by June I was living in the UK. Turns out when I told myself on January 1, 2008 that things were going to be different, I was right. And I know that 2009 promises to be something I haven't experienced before either. After all, I am starting the year in a new country and hopefully on the verge of getting a job to work here (as opposed to having to fly to the USA every time I need some money). So 2009 starts, and I don't know what it will hold. I just know that I'm excited about the adventure to come. 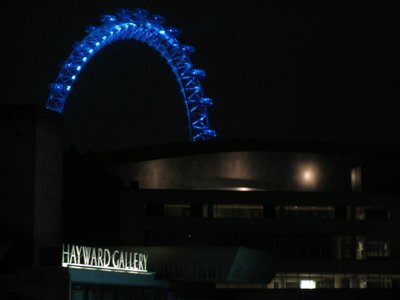 Last night I went to Waterloo Bridge and watched the fireworks put on by the city of London. The fireworks were sponsored by LG, the Korean electronics company. I guess life is good for them if they can afford to put on the fireworks display. 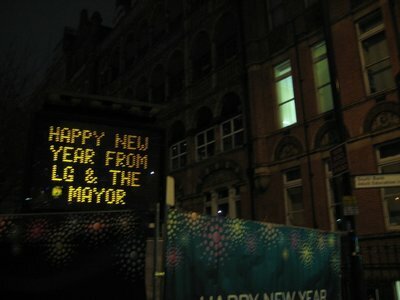 Prior to the fireworks, there were a number of messages broadcast onto the side of building, including a somewhat strange one from Mayor Boris Johnson. Luckily the Gloomadon poppers didn't stop the fireworks display. The night was cold, but nothing compared to last year's Quebec City -35 C.
From Waterloo Bridge I had a nice view of both the London Eye and the Parliament Building clock tower, known incorrectly as Big Ben. Actually, Big Ben is the name of the bell. Either way, the whole thing turns 150 years old this year. 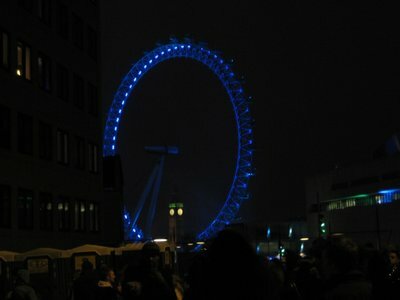 The clock tower, I mean, not the London Eye. That is pretty recent. I would be impressive if the Victorians could have built that, though. A nice thing about London is that you can have alcohol at outdoor public events like this. I went to Sommerfield's and bought an 8 pack of Calsberg. 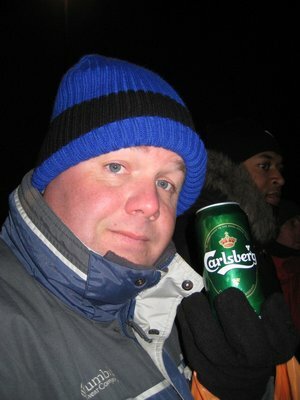 Don't worry, folks, I didn't drink them all last night, but it was nice to have a few beers to warm me up as I waited for the fireworks to start. Finally, the countdown started up, projected on a nearby building in multi-story high letters. Once we hit 0, the chimes from the Clock Tower started at the same time as the fireworks started going off. So, best of the new year to everyone reading. I know this my consistent new year's resolution for life to be different is guaranteed to happen. I wish you all the best in fulfilling your new year's resolutions and wishes. In addition to the Mayor of London and LG, happy new year from me, too. Happy New Year to you too, Greg! May 2009 be just as full of wonderful surprises. And lots of great blogs! Greg, success in 2009. It will be better!